Next day, Saturday's team: Carol Cady, Shayne, Keith Filson, Forrest Wilson, Marbry Hardin, Tom (tj) Johnson. To sum up Saturday's weather... it was 'rain, rain & more rain'... soooooooooooo, Windy River was out of the question... we'll try again next month. The backup plan was Snail Shell cave, an hour away, just south of Nashville. I've been there once before, downstream, but this time it was to push the upstream sump that Brian Williams dove last month. We were late starting, guess around 2pm. To get to the upstream sump, we had to climb, crawl, swim and trudge through sand, gravel & rocks for ONLY 1.8 miles... The six of us hauled personal gear, tanks, regulators and weights for two divers (Forrest & I). Marbry, our mighty team leader, led the way, carrying 2 of the 4 tanks. The tanks included 2 aluminum 20s and 2 steel 46s. The tanks keep getting smaller on some of these trips... The next time, I'm taking a pair of 30s in case we do this cave. 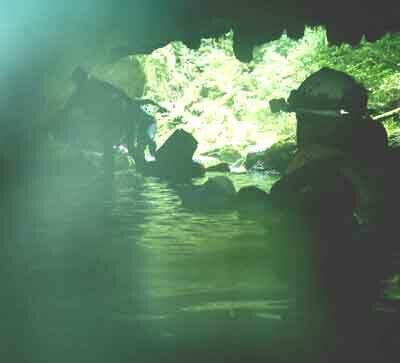 The cave was real wet... an underground river that was shallow enough in half of it, to 'walk'. Some of the team brought inner tubes and one brought a small surf board to 'swim' the first 1/2 mile (all too deep to stand in). I had stuffed foam in my rucksack so it and my wings floated me just fine. During the trek, I had major trouble with the rucksack (camouflaged Wal-Mart Special) because it collected about 25 kilos of water every time I got into waist deep+ water, and it didn't drain out fast enough. I had forgotten my regular pack and picked up this one on the way north. Wearing it upside down helped considerably, but it was still a considerable P.I.A. the whole time... Got to put some drain holes in it before the next trip. 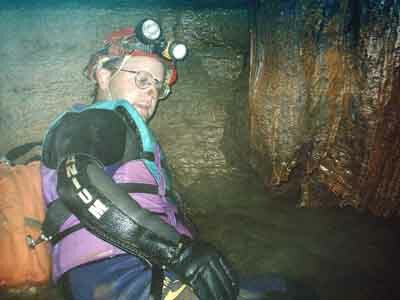 The strobe on the camera quit working (so no good pictures), and I lost it about 1500' into the cave. Keith found it floating on the way out, right where I lost it, so I guess now I've got something to send back for repair. Thanks Keith! It was, as you can tell in the pictures, VERY humid in the cave. Our human steam can be found in about every picture. There were some tough spots on the way in that were, somehow, worse on the way out... There was one really awesome section over and through a water fall of sorts. Then there were lots of breakdowns to crawl/climb over that taxed my (mine at least) energy. After arriving at the sump, Forrest & I geared up and followed the sump line left by Brian a few weeks before. Since I was following right behind Forrest, the VIS was 'poor', but it wasn't tight, and I was able to 'braille' my way through into a big breakdown room with a 'beach'... This 'dry' area gave us a good place we could remove our gear and start the survey. Back at the beach room, Forrest and I geared up to re-enter the sump. Just as Forrest dived under, I had a bit of problem getting my inflator to stop inflating the wing... no doubt some 'beach' sand.. and couldn't, so I unattached it. That delay turned out to be good, since on the way back, I could see the line and some of the sump this time. Upon surfacing, everyone was starting to move, getting up and starting to re-pack & re-distribute our gear for the long trip out. We left our weights, adding to those left earlier by Brian. 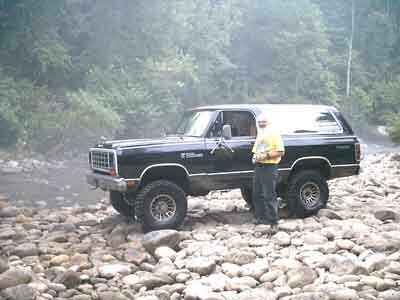 We were out of the cave, but we still had to get out of the sink and hike out of the woods, back to the vehicles. Off we headed, collecting a few things we had left at the cave entrance. 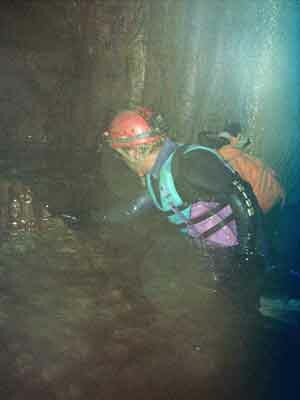 I could not, no way, carry my rucksack and fins out of the very deep, nearly vertical hole the cave entrance was in. So I left them on the 'trail' about half way up. Yes, that is called 'whimping out'... but I had a good excuse for this, but I'm not going to say why in this report. Some dumb things you do, you just don't put in writing... I figured I would come back after changing and getting out of my gear at the vehicles and after a long drink of Gatorade. I was hoping I would recover enough energy to return to them. Well, we made it to the vehicles, wonderful, but it sure seemed like it was an extra long hike back, and one that I was soon to repeat. Once there, Keith asked me to help him remove his pack. Holy cow ^@^**!!! it was my pack. And Kevin had my fins... I love those guys (not in a real personal way of course :).